A mysterious fire over the weekend engulfed the burial site of Mama Betty Kaunda. Lusaka Fire Brigade and Zambia Airforce (ZAF) were called in. 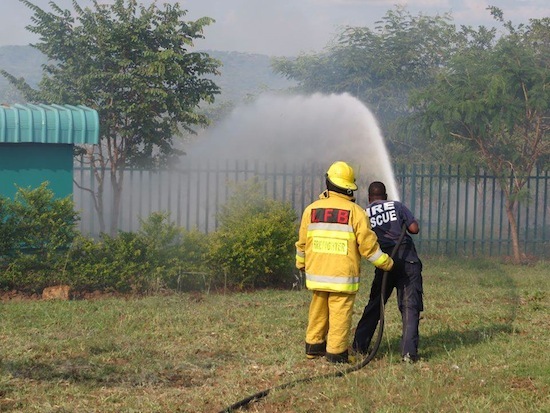 A combined effort of Lusaka Fire Brigade and ZAF helicopters managed to quench the fire. The reason that has been advanced is that a Care-taker saw a snake in the nearby shrubs and decided to light a fire to kill it but the fire quickly went out of control going towards the grave site. But as can be seen from the photos, the grave is surrounded by green grass so fire wouldn’t spread so fast. More mysterious is the silence from the PF media such as the Post, ZNBC and broadsheets. How Possible is that the grave of the wife of the former president can be engulfed in fire; ZAF helicopters are mobilised but the media does not know?